Our offices are equipped with the state of the art CNC engraving and Laser cutting machines. With collaboration with the local architects and interior designers, we produce astonishingly smooth, detailed architectural models, allowing them to provide a physical visual result of their projects to their customers. With our 3D services, you can customize your creative ideas for toys, gadgets, souvenirs and giveaways, using your custom made or free downloaded 3D models, in a variety of colors (dual color) and materials. Our creative team takes engineering concepts from research through development to manufacturing. We develop personalized engineering/automotive parts for each client based on their needs and business objectives, creating a meaningful and useful experience. As product design consultants we add value in a number of key sectors, including product design, engineering, robotics and electronic development. We can produce artistic 3D products (sculptures, artifacts, jewelry, installations), created by studio craftspeople and artists in order to satisfy their creative expressions and designs by using a variety of materials. Our team can provide custom made 3D parts coming from educational institutes for research or educational needs. We provide 3D services using 3D scanned images from CT/MRI scanners, for dental, orthopaedic and prosthetic surgery. 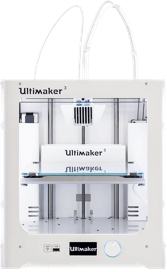 We are the local representatives of Ultimaker’s FDM 3D printers and all their consumables and spare parts. Our engineering team provides training, full support, and maintenance. Copyright © 2019 by 3dmakers.com.cy. All Rights Reserved.